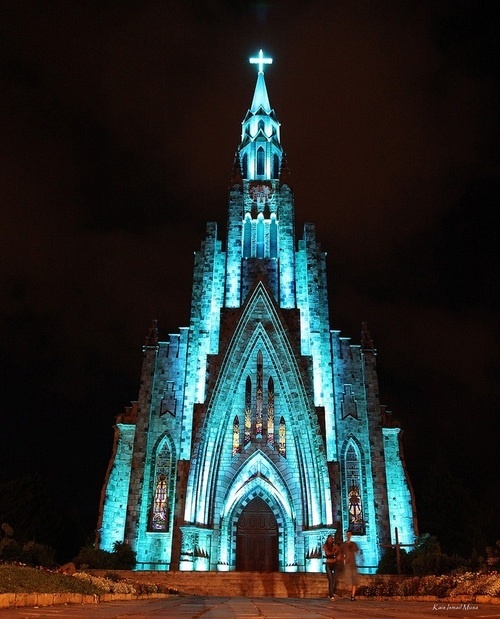 The Cathedral of Our Lady of Lourdes, also known as Cathedral of Stone, is a Catholic church located in the Brazilian city of Canela, Rio Grande do Sul. It is considered one of the major tourist attraction of the Serra Gaúcha. Its characteristic style is English Gothic. The church has a tower with 65 meters high, and a carillon of 12 bells made of bronze by foundry Giacomo Crespi, Italy. In its interior are three panels consisting of painted canvases by the gaucho artist Marciano Schmitz, depicting the "Apparition of Our Lady", the "Allegory of the Angels", and "Annunciation". The paintings of Via Sacra were made by Pablo Herrera, a Uruguayan sculptor and restorer of Sacred Art. Wood and clay were used, with the background painting having superimposed images in clay.